The classic couch is given a fresh new perspective with the warmly welcoming look and feel of the REST sofa. The sofas strongly defined back and frame combine with soft cushioning for maximum comfort. REST is constructed with high quality materials including solid oak wood legs and is upholstered with Kvadrat textiles. Chose between legs in grey, black and oak. Other textiles and colors are available upon request. 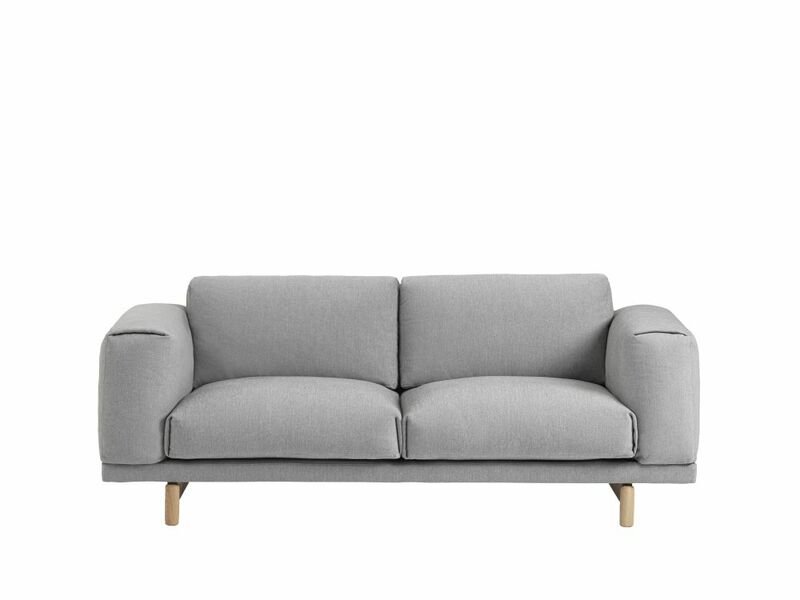 Contact your nearest Muuto retailer for further information on price and delivery. Steel base, wooden frame, oak wood legs, cold foam (35/seat, 25/back) /feather filling, standard fabrics from Kvadrat. Legs: Oak, grey or black. Dry clean only. Unzip upholstery fabric from the cush- ions and dry clean fabric. Remove non-greasy stains by carefully dabbing with a lint-free cloth or sponge wrung out in clean warm water. If necessary, clean by dabbing with soapy water or water with a little dish soap. Finally, dab the surface with clean water. See kvadrat.dk for further cleaning and maintainance intructions for your chosen textile.